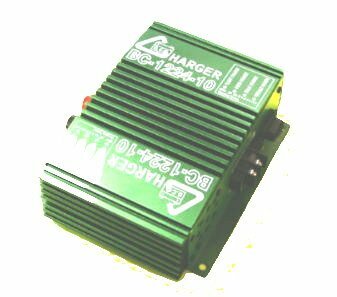 Four stage intelligent charger with 10 VDC to 15 VDC input to charge 24 volt (2x12 volt in series) lead acid batteries, (flooded, VRLA, Gel, or AGM.) Charge a wheel chair, bicycle or scooter in your car or van. An XLR connector cable is also available for those wheel chairs and bicycles that use it. Charge current options The peak charge current can be adjusted to 1-5 amps by internal trim pots VR2 (turn counterclockwise to lower the current) and VR1 (if you can't get low enough with VR2). Click Here for a Dimensioned Drawing. Q: Can I leave the battery continuously on the charger? A: Yes, the charger will go into "maintenance mode" and keep the battery topped off. Q: Can I draw power from the battery when the charger is connected? A: Probably. . . There is some pulsing going on with the charger which your equipment might not be happy with (it is a pulse-charger, 1 second pulses with 20mS gaps), but if you combine this with the battery the battery will fill in the gaps, so the ripple is no more than it would see in an automotive application. Q: If I discharge the battery while the charger is attached will the charger maintain a full charge? A: Yes, When the charger detects that the battery voltage has dropped it knows that the battery needs to be charged and goes into "bulk charge" mode again automatically. Q: Can the charger be left connected to the battery when the charger is not turned on, or when the input voltage of the charger has been cut off? Q: Can the charger be adjusted to lower currents? Charging wheel chairs, bicycles, and scooters in a car, van or bus. Microprocessor controlled 4 stage adaptive charging algorithm suitable for Gel, Absorbed Glass Mat, VRLA, or flooded lead acid batteries. Output short circuit and battery polarity protections. Input low voltage and high voltage connections. Charging 24 volt batteries from a vehicle. Charging 24 volt "jump start" batteries from a 12 volt tow truck or service vehicle. Charging 24 volt electric bicycle from a vehicle. Four stage charge--constant current, constant voltage, fill, and float. This charges your battery the fastest way possible without damaging the battery. It is suitable for any size 24 volt lead acid battery. Charge efficiency is 95% for the a SLA, VRLA, or Gel Cell battery and 85% for the charger, making a combined efficiency of 81%. So a 12 volt 100 AH battery would be able to charge a 24 volt 10 AH battery 4 or 5 times before the host battery needs recharging. A qualified automotive electrical technician should be used to wire the charger into the vehicle. The BC-1224-10 converts 12 volt power into 24 volt power, so for a 5 amp output the input needs over 10 amps. 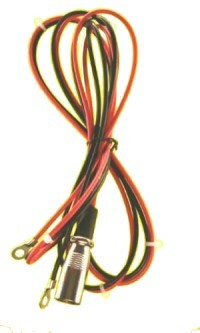 Make sure that the wires connecting the BC-1224-10 are adequate for the current and the length of the run. If the voltage drop in the wires are too much the "Low Battery Voltage" alarm will come on. Wires that are too small may also overheat and melt the insulation, causing a dangerous situation. 12 gauge is usually adequate for runs up to 20 feet of wire (adding together the positive and negative wire lengths). Try to connect or disconnect the battery when the charger power is "on." It is possible but extremely rare for the charger to go into a fault mode if the battery is connected first, but cycling the power switch will clear this "false fault." It is OK to leave the unit on the charger when the power to the charger goes on and off. Mount the BC-1224-10 in an area that will get adequate ventilation and will be free from rain, spray, or excessive dust. Can I charge my wheel chair in the car, Wheelchair chargers, electric bike chargers, and scooter chargers for charging a 24 volt battery from a 12 volt source such as a car, van, or boat. electric wheel chairs car adaptor, 12V DC input wheelchair chargers.